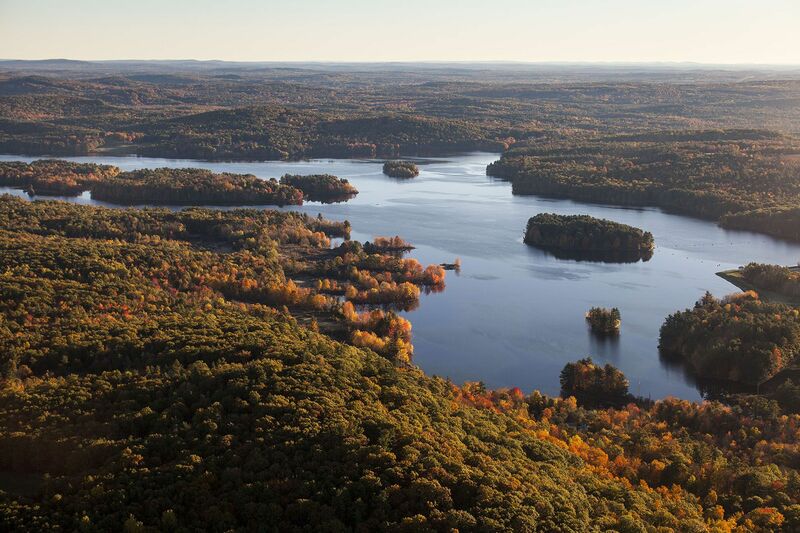 “Androscoggin,” the name of Lewiston’s river and county, is the contemporary word describing a Native American tribe that lived in New Hampshire, Maine, and southern Quebec. The tribe was likely absorbed by neighboring tribes by the 18th century. Hall also notes that one variation of the name is “Amitgonpontook.” As he’s seen “pontook” translated as meaning “falls,” he offers this as an appropriate meaning of Androscoggin: “A place to smoke fish or meat at the falls,” and that’s the translation he’s used in a map of Wabanaki place names in western Maine. 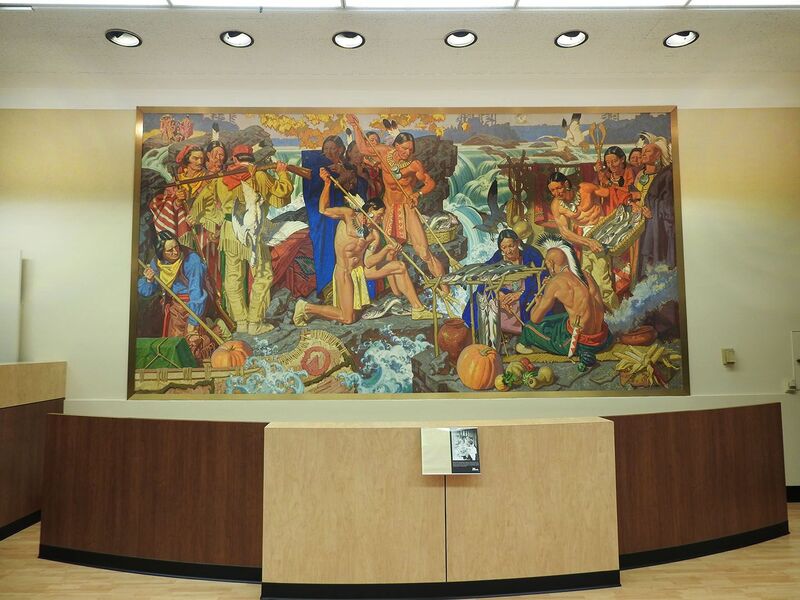 By famed 20th-century illustrator Dean Cornwell, this interpretation of Native Americans fishing on the Androscoggin in the 1600s hangs in the lobby of the Five County Credit Union in Lewiston. The mural was installed in 1960 when the building housed Manufacturers National Bank. Among early settlers, the river name Androscoggin took hold in the 17th century. Some accounts say that then–New England governor Edmund Andros, in an act of self-flattery, made the change to Androscoggin. That’s uncertain, but the garrison-turned mill in Brunswick, Fort Andross, was indeed named for him. The U.S. Geological Survey lists many historical variations of the river name including Ambrose Coggin, Amos Coggin, Andrews Coggin, Andros Coggin, and Andrus Coggin. Incorporated in 1854, Androscoggin County was late to the game: It was the 14th of Maine’s 16 counties. Androscoggin also names a Maine lake and island, an Auburn-based land trust, a dorm at the University of Maine, and streets in New Hampshire (Gorham and Milan), in Massachusetts (Vineyard Haven), and in Maine (Windham, Jay, Mechanic Falls, Bethel, Lewiston, Orono, Greene, Lisbon Falls, and Brunswick). There’s even an Androscoggin Bluffs in Livermore Falls, Maine. And there’s a ranger station in Berlin, N.H.; and many businesses and organizations, including a bank, humane society, and orthodontist. And, the Androscoggin Scholarship Fund the name of the Bates fund, supported by the college’s local friends and supporters, that awards need-based financial aid to students who from the communities within Androscoggin County. One of the newest places to carry the Androscoggin name is the Androscoggin Riverlands State Park, established in 2009 right across the river from the Bates rowing team’s boathouse in Greene.